Czestochowa, Poland, 1300 years later? Where do you start? I guess the beginning would be best. Our Lady on a table top in St. Joseph’s workshop in Nazareth. to Her tell about the Miraculous Conception and Birth of Our Lord Jesus. the most beautiful Woman the world has ever known? both wrote that St. Luke painted the image of Our Lady. gives it away is Our Lady’s eyes. Pieta, captures the anguish of Our Lady, painted by St. Luke. in the eyes of Our Lady depicted by St. Luke. could see – the Passion, Crucifixion and Death of Her Son. world to see and know. concur that it could very well have been St. Luke. Why not? It is easier to determine that St. Luke painted the image which is now in Czestochowa than to track the history of the image down through the ages. Everything we tell you of the early history of the movement of the image of Our Lady is from tradition. The first movement out of Jerusalem occurred when the Romans came and destroyed the city in 70 A.D. It was brought by zealot Christian women up to the mountains, where it remained, to the best of anyone’s knowledge, for 300 years. Now, it had to have an enormous amount of meaning to the daughters of Jerusalem, who cared for it over the centuries. Great pains were taken to insure that it was protected against all who came against the Church and the early members of the Church. They hid the image in caves, and through various underground tunnels to safe havens. They did this under the threat of imprisonment, torture and death, if caught. In the year 326, or thereabouts, Queen Helena arrived in the Holy Land to gather relics of the early Faith, including parts of the True Cross, one of the Nails, part of the Crown of Thorns, as well as the sign above the Crucifix of Jesus, which read, “INRI, Jesus of Nazareth, King of the Jews” and the firsthand image of the Blessed Mother of God, painted by the evangelist St. Luke. This was certainly an important relic to bring back to her son Constantine. When St. Helena arrived in Jerusalem, she was put in contact with the holy ladies who had been unofficial custodians of the only original painting of Our Lady in existence for all those centuries. The fame of St. Helena must have preceded her to the Holy Land, because she was given charge of this most important painting without hesitation. She brought it back to Constantinople along with other relics, and presented them to her son. He was so taken back by the beauty of the image, but also the sadness, he had a church built in Her honor, dedicating it to the Holy Name of Mary. Did Constantine spend time with Our Lady here in this Church? Did he try to imagine, looking at the eyes of this most magnificent painting, what She was feeling as She recounted the sufferings of Her Son? Did She speak to him there? Did he listen and act on Her words? The Church and the image drew pilgrims from hundreds of miles around. They came and prayed; they petitioned Our Lady. Our dear Mother Mary blessed those who venerated Her image in that place. Healings and miracles took place. People from far and wide came to the church for healings and conversions. Dear Mother Mary answered all their prayers. The image of Our Lady became famous throughout the country. So powerful was the image of Our Lady in Constantinople, that the people venerated Her in this church for centuries. The future emperors of the Byzantine Empire gave Her the same honor and respect that St. Helena and her son Constantine had done during their lifetimes. As a matter of fact, they used the painting to protect them from an onslaught by the Saracens in one of their many failed attempts to conquer Constantinople. In this instance, the people of the town had so much faith in the power the Lord Jesus had given to Our Lady in this image, they carried the image throughout the city and around the barriers surrounding the city. The Saracens could see the power of God in this image of Our Lady, and fled in fear. It is reminiscent of the Miracle of the Eucharist of Assisi when St. Clare of Assisi held up the Monstrance with Our Lord Jesus present, to ward off an attack by Saracens on her convent. They looked up at the Monstrance, saw the power of God in it, and ran for their lives. They never returned to San Damiano or Assisi again. Over the centuries, the Byzantine Empire lost more and more of its territory, and more and more of its power. Factions attacked from all sides weakening the empire. Infighting among the rulers also helped to bring about the demise. But most likely, the most significant factor, which led to the decline and fall of the Byzantine Empire, was it turned its back on Our Lord Jesus and His Mother Mary. History does repeat itself, make no mistake about that! We have seen more instances of great powers brought to their knees when they have walked away from Our Lord Jesus and His Mother Mary. The Byzantine Empire was no exception. There was a complete breakdown in religious practices. Some of the emperors hated Christianity, and actually went out of their way to destroy any vestiges of devotion, statues, relics and sacred objects. However, the image of Our Lady was so important, and of such spiritual value to the nobility of Constantinople, they hid the image inside the palace of the emperor. Actually in some cases, the wife or daughter of the emperor hid the image for safe-keeping. Then, during the next five hundred years, mothers would bequeath the image to a daughter or son who had not lost his faith, and still honored the Sacred Painting; and they would give it as a wedding present, or on some similar occasion, to another child, until such time as the city of Constantinople was in danger of being destroyed by the Moslem hoards. If we were to take a look at the Byzantine Empire, at the time of its inception, it covered a great span of countries. In 550 A.D., it encompassed all the countries around the Mediterranean Sea, including Italy, Greece, the Holy Land, southern Spain, and Northern Africa. In 1050 A.D., in the midst of its decline, it only controlled Italy, Greece, and Antioch. In 1453, it fell to the Ottoman Turks, and by the beginning of the Sixteenth Century, the Byzantine Empire was no more. Tradition tracks the movement of the Sacred Painting of Our Lady from Constantinople to Russia. The reasoning for this was that “…the Christian Faith moved through Bulgaria, Moravia, the Czech Republic and finally to Russia.” The next question we would naturally ask is, “Well, how did it get from Russia to Poland?” Our research tells us that there was a great deal of inter-marriage between Russian autocrats and Polish royalty. A most appropriate dowry gift to be given was the Sacred Image of Our Lady. So the painting was protected and circulated over the centuries by the nobility, first of Russia, and then when the Ukraine collapsed and became part of the kingdom of Poland, it wound up in a castle in Belz, a region which had been in Russia and then became part of Poland. Upon the death of King Casimir the Great, the throne was put into the hands of Prince Ladislaus. When Ladislaus assumed the throne, his first act was to recapture all the castles which had been controlled by the Russians. Upon the capture of the castle at Belz, he gave great respect and honor to the Sacred Image of Our Lady. At this point, the Sacred Image was raised to the level of a Shrine. A special place was given to the image within the castle, and great reverence was paid to Our Lady. The Byzantine Empire evolved from the Roman Empire in the 5th century. The Ottoman Empire finally captured Constantinople in 1453, signaling the demise of the Byzantine Empire. Read more about this Miracle of the Eucharist in Bob and Penny Lord’s book, This Is My Body, This Is My Blood, Miracles of the Eucharist. 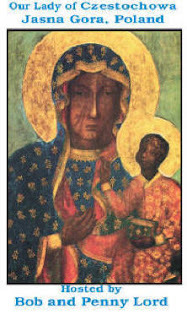 You are currently browsing the archives for the Our Lady of Czestochowa category.